NASA's Mars Exploration Rover Spirit acquired this high-resolution view of intricately layered exposures of rock while parked on the northwest edge of the bright, semi-circular feature known as "Home Plate." The rover was perched at a 27-degree upward tilt while creating the panorama, resulting in the "U" shape of the mosaic. (A) The northern edge of Home Plate, (B) the coarse-grained lower unit, (C) the fine-grained upper unit. Spirit acquired 246 separate images of this scene using 6 different filters on the panoramic camera (Pancam) during the rover's Martian days, or sols, 748 through 751 (Feb. 9 through Feb. 12, 2006). The field of view covers 160 degrees of terrain around the rover. NASA'sSpirit rover has stumbled upon evidence of an ancient volcanic explosion at"Home Plate," a plateau of layered bedrock near the rover's landingsite in Gusev Crater. 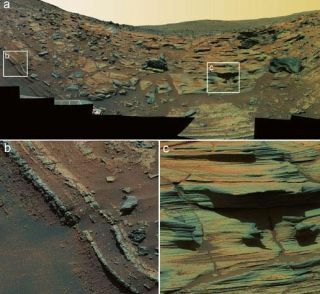 The findinglends more evidence to the idea that Mars had a watery past, and marks thefirst explosive volcanic deposit seen by Spirit or its rover twin, Opportunity. However, scientists have long known ancient Mars wasvolcanic. The evidence is plain: Olympus Mons, the tallest known volcanoand mountain in our solar system. Steve Squyres of Cornell University, said the rock'slayers are probably from a volcanic explosion. The findings are detailed inthe May 4 issue of the journal Science. Evidenceshows the area near Home Plate is mostly basaltic rock--indicating water mayhave mixed with magma beneath the Martian ground. When basalt erupts, Squyres said, it's normally smooth-flowing lava and notblown outward. "One way for basaltic lava to cause an explosion is for itto come into contactwith water--it's the pressure from the steam that causes it to goboom." The explosivebasalt isn't the only red flag for water. Another example is the high chlorinecontent of the rocks, which might indicate that basalt had come into contactwith brine, or saltwater. But one ofthe strongest pieces of evidence is a "bombsag" on the lower slopes of the plateau. On Earth, bomb sagsform when rocks eject skyward by a volcanic explosion and fall into softdeposits which deform as they land. Spirit and Opportunity are in their fourth year of exploringMars. As of April 26, Spirit had spent 1,177 sols, or Martian days, on thesurface of Mars and had driven 4.4 miles, and Opportunityhad spent 1,157 sols and driven 6.5 miles. "Consideringtheir age, both rovers are in good health," said John Callas, project managerof the Mars Exploration Rover mission at NASA's Jet Propulsion Laboratory, Pasadena, California.